My first summer as a homeowner in Florida was brutal. The heat during the day was unbearable and I swear it all got trapped in my garage. I couldn’t stand to be in the garage for more than a few minutes and I’d often leave the door into the house open so I could get a little of that sweet, sweet air conditioning. I ended up doing a lot of research on how to keep my garage cooler in the summer and I want to share a few of those ideas with you. Hopefully it’ll save you some time and give you a few ideas that you might not have thought about. How do you keep your garage cool in the summer? The best ways are to create some air circulation with ceiling fans and garage vents in the ceiling or exterior walls. Air conditioning is an option for some, but it’s usually considerably more expensive. Of course, don’t overlook insulating the walls and garage door as well as making sure your weatherstripping is doing its job. Here are some of the best ideas that I’ve found to help keep your garage cool, along with a little commentary on each. Without a doubt, you’ll feel the biggest impact just by installing a fan in your garage. They’re also some of the cheapest options on this list – except for some of the free tips I’ll get to later. Garage fans come in two major types: ceiling fans or wall-mountable\floor-standing fans. Ceiling fans will mount to the ceiling, just like they would inside your home. They always face down from the ceiling and will have the best circulation directly underneath. If you’ve got a larger garage, you’ll need larger blade lengths (60″ or above) or even multiple smaller ceiling fans. Wall mountable or floor-standing fans will direct the air horizontally across the garage – hopefully out the door or to an exterior garage vent. Whether you’re mounting the fan on the wall or have a free-standing unit that you can move around, the concept is the same. What I look for first in any fan is the cubic feet per minute (CFM). 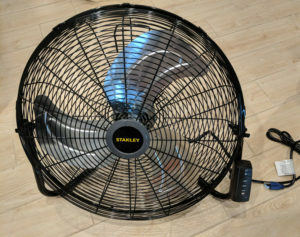 The higher that number, the more air the fan is going to move. If efficiency is your thing, you can also look at CFM per watt of power the fan uses. Again, the higher number, the better. One of the more common types of fans you’ll see are indoor\outdoor fans, but that shouldn’t be necessary unless your garage is exposed to the elements. Then you’ve got much bigger problems. Instead, opt for a an that has metal blades instead of wood or plastic fan blades. Metal blades are normally lighter and are easier to clean. Also, be sure that the fan you’re looking at has a sealed motor housing. Your garage can be a messy place. This will help keep out sawdust and other flying particles. Bonus: flying insects don’t like moving air, so this is also a great way to get those flying buggers out of your hair. You know that old saying: it’s not the heat, it’s the humidity? Since I moved to the hot-and-humid Deep South, one of the best things I did to make my garage more bearable in the summer heat was to start using a dehumidifier. This obviously isn’t as useful if you’re living in the “dry-heat” Southwest where temperatures can hit 120 degrees, but with essentially no humidity. For the rest of the country, a dehumidifier should be on your list. One of the key features to look for is a drain hose connection for a maintenance-free operation. This lets you hook up a regular garden hose to the dehumidifier so the water drains out on its own. For less than $200 you can get a heavy duty, 70 pint dehumidifier that is rated to cover 2,000 square feet of your home. You may not need that much, but it’s better to (slightly) over-buy than to over-work the unit. There are three major areas where you need insulation in your garage and it’s a good bet you’re missing all three. The first is the garage ceiling. This is especially important if your house has a bedroom above the garage like mine does. My master bedroom sits directly over the garage and you can definitely feel it in the summer. All that heat comes radiating through the floor and my air conditioner works overtime to try to keep the house cool. The next item on the list depends on your construction. If the outside of your house is aluminum siding, wood or stucco, you’ll definitely want to insulate and drywall your garage walls. This will help seal up any air leaks and keep the cool air in and the hot air outside where it belongs. If you’ve got cinder-block walls on your garage like I do, I’d start with insulating your garage door, which I’ve covered in another article. Remember that your garage door is the single biggest opening in your home. You wouldn’t dream of having leaky windows, so why have a leaky garage door? One of the little tweaks on my list is to fix the weatherstripping around my garage. Simply sealing up the air gaps around your garage door, windows and even the door to the house will go a long way to keeping your garage cooler. If you’re working on your car in the garage, you need to have a garage vent. Period. When used with a fan, a garage vent will help keep the air moving so it doesn’t feel as hot. More importantly, you won’t be inhaling any toxic fumes from your engine. The most common garage vent is a simple turbine fan that sits on your roof so it can vent the warm air straight up and out. In my house, I’d need to have a vent on one of the walls, since there’s a bedroom directly above the garage. Be sure to keep the vent as high as it can be so that the warmer air gets blown out. Without a doubt, this will do the best job of keeping your garage cool. It’s also by far the most expensive. The cost of adding an air conditioner to an existing garage is very high, and it can hit you in several different ways, depending on how you install it. Cutting or chiseling out a hole to install a window air conditioner will add potential leaks to your home, nullifying the effect of that insulation you installed earlier. Plus, window air conditioners are much less efficient than their whole-house counterparts. This will end up costing you more in the long-run. Speaking of whole-house air conditioners, you could add some additional ducting in your garage ceiling right? Well, yes, but it’s not a great idea. Matt Risinger, who is a builder with a great YouTube channel, has a video which goes into the why’s, but I’ll sum it up here. : Not only will you be overworking your air conditioner unit, but you can create a negative pressure zone in your house as it tries to replace the air that you’re pumping into the garage. It’s going to get that air from other places, some of which could be releasing toxic fumes into your home. Bottom line, only add air conditioning to your garage as a last resort. Stay with me now, because I’m going to say something crazy: The more the sun hits your garage, the hotter it’s going to get. But in all seriousness, one of the cheapest ways to keep your garage cooler is by stopping the sun from beating down on it all the time. Obviously this is a long-term solution, and there may be issues if you live in a community that has a homeowner’s association (HOA). Think about adding a shade tree, a climbing vine like ivy on the walls or even an awning that over-hangs your garage door. I needed to see this to really believe it. 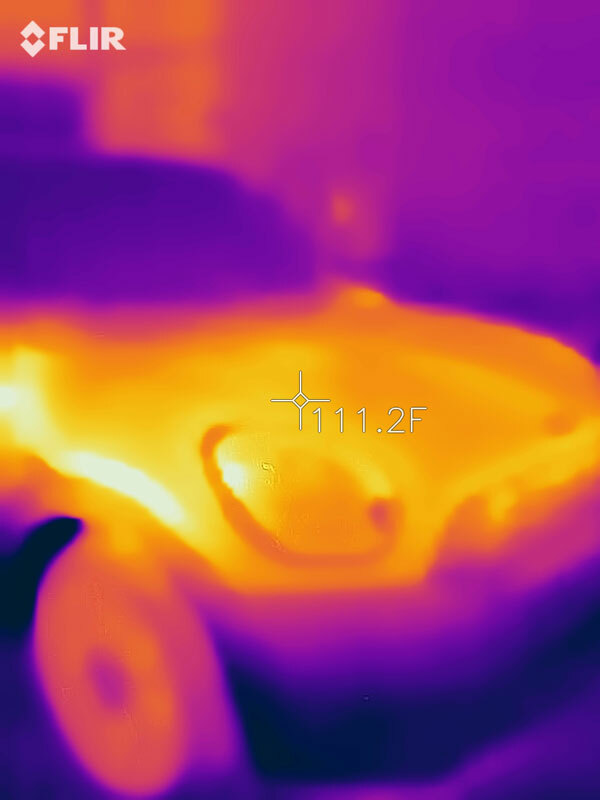 This is a thermal image of my car sitting in my garage, almost two hours after I got home. That bright yellow spot is residual heat from my engine acting as a giant space heater for my garage. Your car is basically a big metal box and all those metal surfaces store heat really well. When you pull your car in your garage, your car is going to start transferring that heat into the surrounding air. If you don’t believe me (and don’t have access to a thermal camera) then here’s a little test. The next time you’ve driven your car home from work, park it inside with the garage door closed and the lights off. Wait about 30 minutes and put your hand on the hood of the car. You’ll still be able to feel the heat of the engine well after you’ve come home. My challenge is that I need to find ways to keep my garage cool in spite of my car being there. The whole point of transforming my garage is to give my car a better home, so it’s important to make sure ell of these other things are in place. How do you keep your garage cool? It doesn’t have to cost a lot of money to keep your garage cool in the summer. Some of these tips have been quick and easy (and cheap), and some have been far more in-depth. Have you found anything that works for you? Leave a comment below.